Tarsiers are quite a formidable tourist attraction. In fact, visiting Bohol would not be complete without a stopover to see the tiny – only about the size of a closed fist – primate. Another fact: Tarsiers (scientific name: Tarsius syrichta) are not exclusive inhabitants of Bohol. They are also found in Samar and Leyte. Lately, there were reports of tarsier sightings in Surigao del Sur and in North Cotabato. And yes, there are tarsiers in South Cotabato, too, particularly in Purok Bagong Silang, Barangay Linan, Tupi within the Mt. Matutum Protected Landscape (MMPL). According to estimates, about 120 tarsiers are living in a 500-hectare habitat very close to a Blaan village. Since their discovery by lumad residents in 2009, South Cotabato’s tarsiers have increasingly drawn attention among local tourists wanting to actually see the nocturnal creature. Meanwhile, sensing the potential for an eco-tourism activity in the area and the pressing need for conservation of the habitat and protection for the rare species, the local government unit called for assistance from the Endangered Species International (ESI), a US-based global nongovernment organization actively involved in advocacy to reduce human-induced species extinction. In response, biologist Pierre Fidenci, president of ESI, and his team, came to the place around the last quarter of 2010 to conduct a research focused on the protection on the conservation of the tarsiers and its habitat. Results that study were used as basis for the planning and development of eco-tourism in the area. The most salient element in the eco-tourism program for the tarsier sanctuary in Purok Silang was the decision of the LGU, following the recommendation of the Protected Area Management Board (PAMB) of the MMPL, to close the 500-hectare area to mass tourism or walk-in tourists. Instead, the LGU, along with its partners , has designed an eco-tourism program for the Barangay Linan tarsier sanctuary called VOLUNTOURISM, coined from the words volunteers and tourism. “Voluntourism centers on encouraging tourists to volunteer for the rehabilitation and protection of the tarsier sanctuary, not on showcasing the tarsiers. 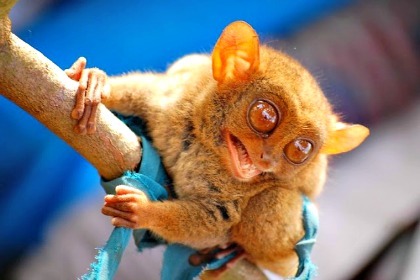 Getting to see a tarsier is a bonus,” he told the visiting government information officers. Fortunately, during the ICON 12 “Dalaw Turo” in the area, a young tarsier was resting on a branch of a coffee tree only several meters from the community meeting hall. However, ICON 12 members were only allowed to see the tarsier after a reminder to strictly follow some rules: no sudden movements, no camera flashes, no noise. Visaya elaborated further that Swire Pacific Offshore (SPO), an international shipping company based in Singapore, has already joined in the voluntourism program by sending volunteers, mostly seafarers, to help in the conservation of wildlife habitat as a strategy to restore the forest cover. Volunteers conduct tree growing and tree monitoring activities, clean-up drives, nursery establishment and other activities in the area. They have also adopted freshwater turtles as a flagship specie. Following this example, he said, other groups may adopt site – at least 1 hectare -- within the sanctuary and plant 500 indigenous tree species, which will be geo-tagged for monitoring. They may also conduct community outreach program such distribution of goods, school supplies, food, or sponsor scholarship of some young residents. “Volunteers may also come to the community to help provide alternative sources of livelihood to the residents who had given up their stake over the tarsier habitat in favor of the conservation activity,” Visaya continued. Purok Bagong Silang is comprised of at about 30 households, whose main source of living is farming. With their farming activities within the tarsier sanctuary suspended, these residents need to shift to other sources of income. During the ICON 12 Dalaw Turo activity, a resident appealed for training that would improve the quality of their handicrafts made from bamboo and other indigenous materials as well as training on processing local produce such as coconut, rootcrops and others.